If you bought the first release of the add-on you only have to pay the difference between the UVPackmaster 2 price and the amount you already paid. Contact us at [email protected] and we will send you a discount code. i have a qeuestion about this. I own UVPackmaster Pro. 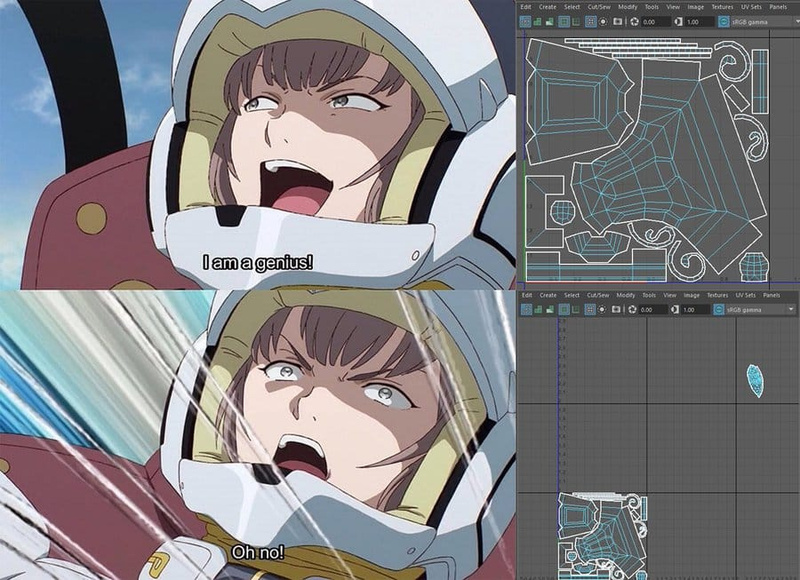 How much do I have to pay to upgrage to UVPackmaster 2? I payed 12$ during the sale. Will this be taken into account, and I lose the advantage of the sale? a fix for packing multi objects being instances of each other. This release also increases the maximal value for the rotation step parameter to 180 (applies to both versions: Blender 2.79 and Blender 2.80). (Note that all those improvements are already included in UVPackmaster 2.0). @red2blue We wouldn’t like people to lose the advantage of the sale, so you will only pay the difference between the normal add-on price. 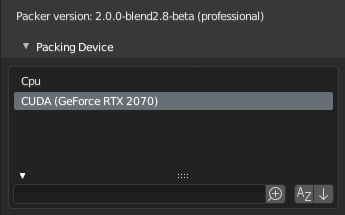 Currently the only non-CPU packing devices supported are Cuda-enabled GPUs (compute capability 3.0 or higher). 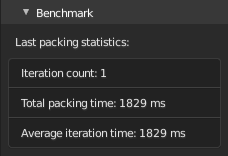 Important thing to keep in mind is that the Cuda version of the packing algorithm is at the beginning of its way to being 100% optimized. It means that you shouldn’t always assume that packing on Cuda will be significantly faster than packing on CPU. The performance ratio depends on specific GPU and CPU models you have in the system and packing parameters. The rule of thumb is that the larger the ‘Precision’ value and the smaller the ‘Rotation Step’ value, the more advantage GPU packing takes over CPU packing. In this scenario the ‘Precision’ value is not so large, at the same time the ‘Rotation Step’ is quite large, that is why GPU is only slightly faster than CPU. Summary: packing on GPU is currently most useful when packing islands with a higher precision or if you want to consider many orientations of every island. It is especially useful when the heuristic search functionality is in use at the same time: when processing many orientations the heuristic search algorithm will examine a very broad set of solutions so the performance (i.e. time of a single packing iteration) is critical here. When packing on GPU the performance penalty from the large number of orientations will be small so the number of iterations performed in a given time will be much larger - you can find an extremely tight solution in a short time this way. Another advantage of GPU packing is that your CPU resources are free during a heuristic search, so you can comfortably perform other tasks on your computer while UVPackmaster is searching for a solution. Is it even legal to make solutions so awesome? I thought it was already fast in 1.9, but JEEZ. I think unwrapping as a dedicated specialization died off right in this thread. That’s all very lovely, but how do I upgrade to 2.0? I suggest putting this info in the opening post. Loving 2.0’s beta so far! Do you guys publish a roadmap somewhere? The problem with this idea is that the relation between 3D verts and UV verts is not 1-1: there can be a few UV verts belonging to different islands, such that each of them corresponds to the same 3D vert. Hmm, good point. 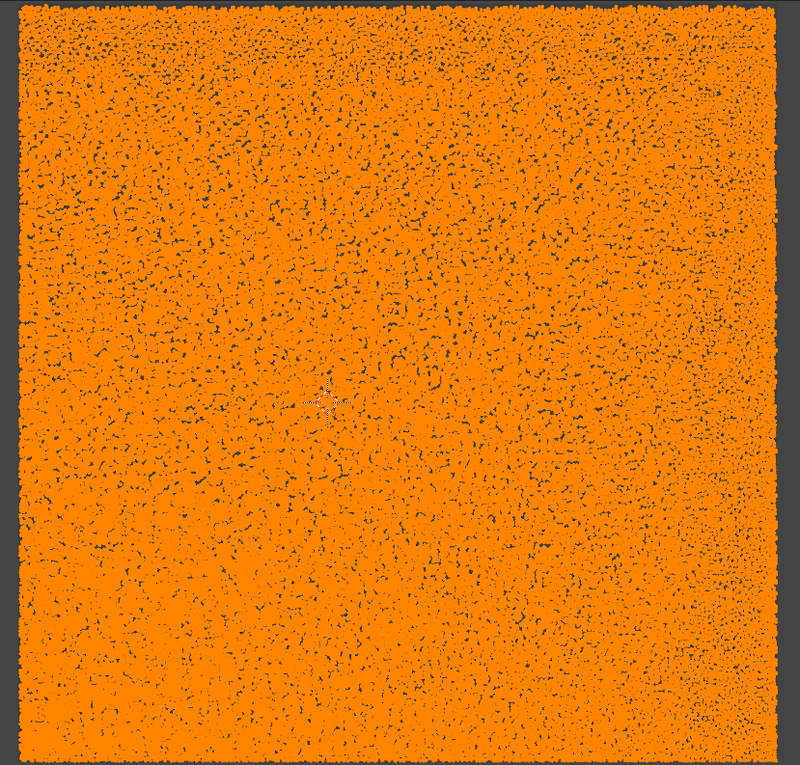 I know vertex colour can offer colour-per-face rather than vertex, would this be an option? As far as I know vertex color is also defined per-3D vertex. Could you describe a situation when the functionality proposed by you would be useful? ‘Pack To Others’ option was not supported when packing into a non-square texture. You can also easily undo the adjustment operation using UVPackmaster2. In order to do that select given islands and click ‘Undo Islands Adjustment’ button. After the action is done islands will be deformed again when dispalyed at the non-square texture. 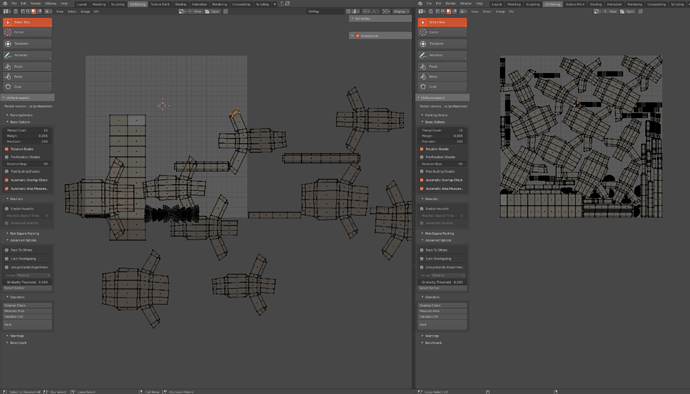 When you close the texture you will see that the islands will have proper proportions at the unit UV square. 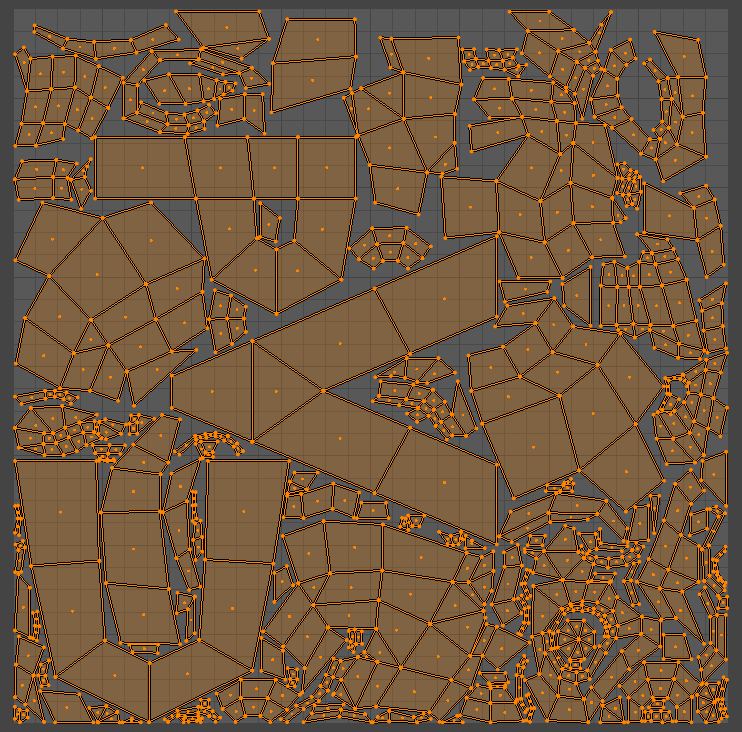 Note that for the undo operation to work properly the texture used at the time of undoing must have the same ratio as the texture islands were orginally adjusted to. You can get UVPackmaster2 from here. There are typically islands you want to keep relatively smaller (insides of items, parts that won’t usually be seen) or larger (the face, other areas of interest), and it’s nice to know they’ll always be packed at their correct size. I tend to use alt-a a lot to keep things at a similar texel density, and that fucks up any manual sizing, so having it be defined per-island would be a real lifesaver! This button allows you to mask by selection, and only paints on those specific faces, meaning: with hard edges around it. The core of UVPackmaster provides a very efficient packing algorithm, but before it can begin its work the Python part of the add-on must prepare UV data accordingly. This initialization part causes some overhead. In the first release of UVPackmaster the initialization phase wasn’t noticable with average UV maps - packing started immediately after the button was pressed. Unfortunately the problem was visible if the UV map contained a lot of islands (1000+), in such situation Python overhead could be noticed and in extreme cases (a map with a huge number of islands) it was really significant. To mitigate this issue we refactored a lot of Python code in UVPackmaster2. Also some work done previously in the Python phase was moved to the core which resulted in a significant speed up. Is there any way of automatically grouping connected geometry parts together? What’s the method for getting shell rotation to work? My assumption was that if I set the Rotation Step to 90 that it would take my existing shells and only rotate them in 90-degree increments, yet I’m finding that not to be the case. My shells end up in all sorts of angles but that’s not what I’m looking for. On the left is the initial layout of the shells just from me cutting them up. You can see the 90-degrees set there. On the right is what I get after packing all of those shells. You can see the “T” shaped ones get put at random angles, but I wanted to keep them at 90-degree increments of what they are from the orientation on the left side. You’ll need to make sure you turn ‘pre-rotation disable’ on, and it should work then. @Dheim As Michael already pointed out, you can achieve what you want by enabling the ‘Pre-Rotation Disable’ option.